OpenStreetMap is a free project for the joint development of public maps and diagrams of cities, streets, roads with the help of manual or automatic data entry, as well as obtaining data from portable GPS-receivers. The project site runs on the MediaWiki engine, similar to Wikipedia. Maps are licensed under the free license CC-BY-SA 2.0 (for CC-BY-SA 3.0 license, Which is used in particular for Wikipedia's text content, the project has not been transferred, but version 2.0 is compatible with it, and OpenStreetMap has nothing to do with the Wikimedia Foundation. I found the plans of many cities that are not in Google maps, or Yandex.Maps. renderer works directly in the browser using WebGL. A map with filters for the most convenient organization search. On the right, you can choose what you want to see on the map by category. In the top menu, you can make a selection by groups, mark all at once, or remove all marks. If you notice an inaccuracy, you can go to the source of the map source - OpenStreetMaps in your account and correct the errors. The Russian part of OpenStreetMap. 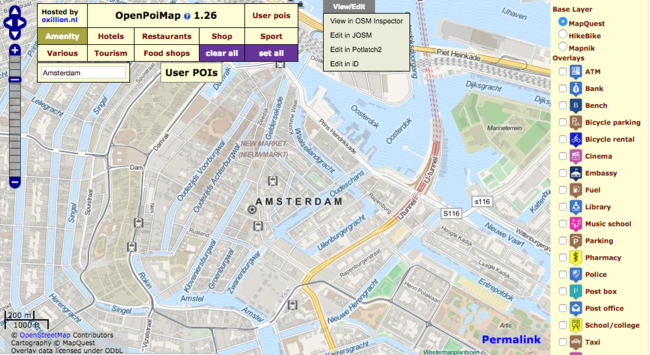 The site is somewhat similar to the original one, but here you can choose the maps - Bing Snapshots, Cosmosnimki, Bicycle Map and a number of more. This is convenient because the original OpenStreetMap does not have pictures of the ground. Public vehicles of the world on a map. Another map that uses the base OpenStreetMaps. On the map you can see the red dots, by clicking on them you can get the route of the transport with the schedule and you can watch the vehicle finding in real time where there is such a possibility. Map of the world metro. You can choose a city in the search form or in the list, the zoom will not work. This is an open map and is created by the whole world. Therefore, not everything is noted, for example, the Metro of Moscow is there, but it is empty. Probably because we have enough good Moscow metro cards, so it is not in demand. Filters allow you to disable subway lines. It is possible on a time scale to examine how the metro looked like, how it developed. The map shows the lines of public transport that have been entered into the OpenStreetMap database. That is, this is an OpenStreetMap map with superimposed public transport lines. Control just zoom. First, we see the routes of intercity transport, as the city approaches, we see intracity transport. There are filters that disable the map and we see only the routes, or makes the map pale. Worldwide public transport facilities on a uniform map. The card is open and evolving. More details are routes, airports ... where there are more active Internet users. This is first west and major cities.